The project at St Botolph’s was eminently pragmatic, working with people individually to find long-term accommodation in hostels and providing support in establishing a life beyond their homelessness and addiction. 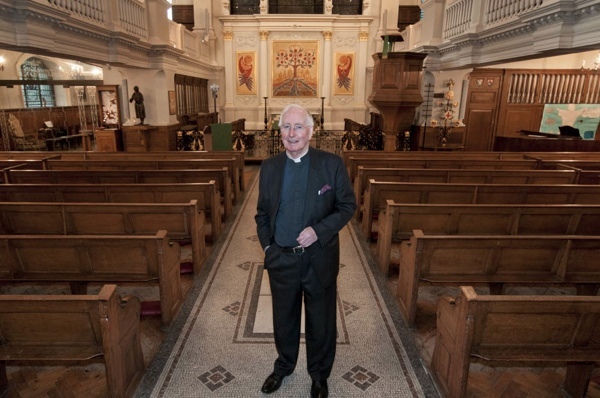 But shortly after Malcolm left St Botolph’s in 1992, the shelter was closed by his successor and it has sat unused for the past twenty years, making it a disappointing experience for Malcolm to return and be confronted with the shadow of his former works. 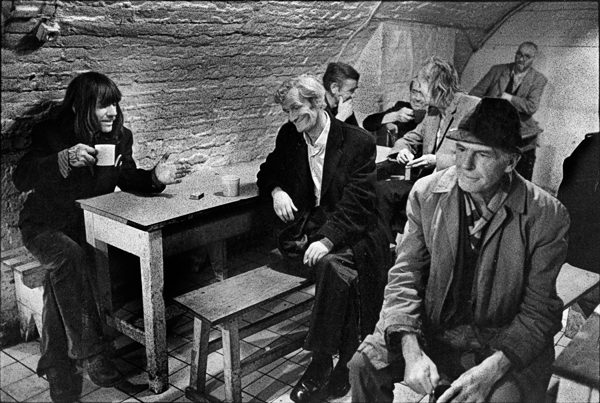 “I can’t tell you how upsetting it is, seeing it like this – it used to be such a wonderful place, full of energy and life, and now its just a store” he admitted to me when Photographer David Hoffman & I accompanied him on a visit to the disused crypt last week. Yet it proved to be a pertinent moment for reflection, as Malcolm told me the story of how it all happened. “I had been Chaplain at Queen Mary University for seven years and specialised in counselling gay and lesbian people, so the Bishop thought I needed a quiet City parish where I could get on with my writing next. But, when I arrived. 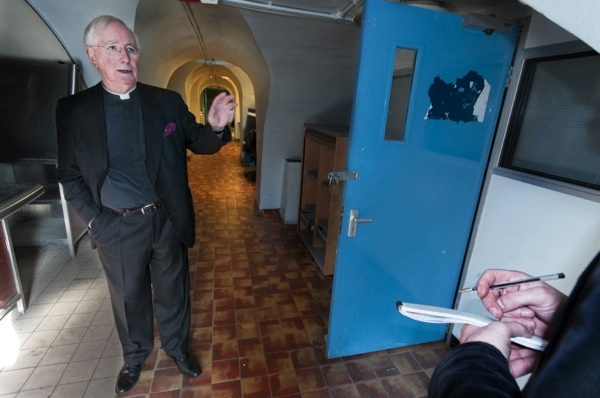 the crypt had been operating for five years and was catering for seventy homeless people each night, and I felt that wasn’t enough. I realised that we were here in the City of London surrounded by big companies, so I went to ask their assistance and I was lucky because they helped me, and I persuaded the City of London Corporation to give us seventy-thousand pounds a year too. The volunteers were all sorts, housewives, city workers after a day at the office and students from the polytechnic. I decided that it would be a wet crypt and we wouldn’t charge for food. 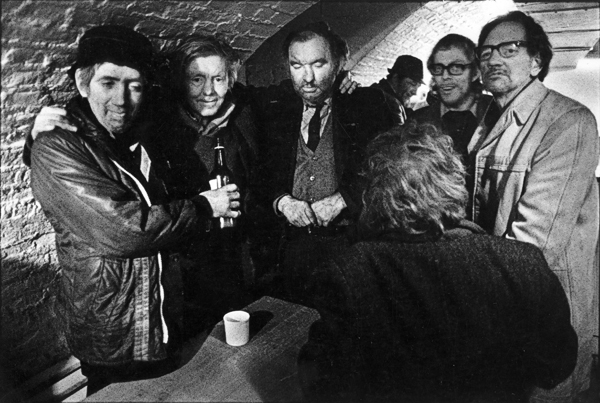 I was the rector upstairs and the director down here in the crypt – I believed the church had to be one outfit, upstairs and down. I went to Eddy Stride at Christ Church Spitalfields to ask what I should do, I had no experience so I had to learn. Over time, we expanded the shelter, we had quite a lot of full-time workers and we established four long-term hostels in Hackney. We were getting about two to three hundred people a night and it was quite an experience, but I was never frightened. Only once did a man take a swing at me, and all the others gathered round and grabbed him. The crypt of St Botolph’s is still equipped as a homeless shelter, functional but abandoned, pretty much as Malcolm left it and still harbouring emotive memories of those who passed through, many of whom are now dead. Encouragingly, Malcolm told me the current rector is considering whether it could be reopened. This would itself be sufficient story and achievement for one man, yet there was another side to Malcolm Johnson’s ministry. As one of the first in the Church of England to come out as gay in 1969, he established the office of the Gay & Lesbian Christian Movement at St Botolph’s and even became known as the Pink Bishop for his campaigning work. “I had always thought that if clergy can bless battleships and budgerigars, we could bless two people in love,” was his eloquent justification for his blessing of gay couples. 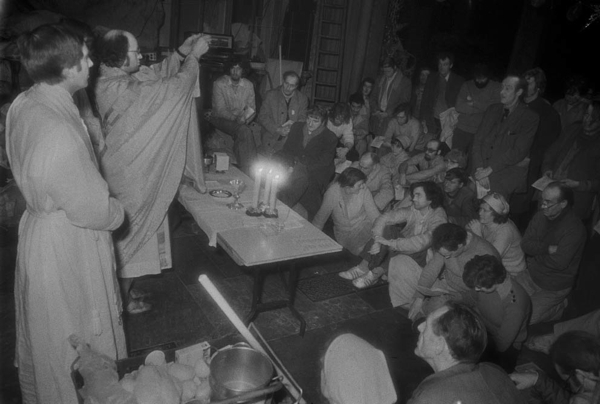 Unsurprisingly, it was a subject that met opposition within the Church of England but, by the mid-eighties, the subject of AIDS became an unavoidable one and St Botolph’s was the first church to appoint a full-time minister to care for those affected by the HIV virus, as well as opening a dedicated hostel for this purpose. In spite of his sadness at the closure of his shelter in the crypt, it was inspiring to meet Malcolm Johnson, a man with an open heart and a keen intelligence, who had the moral courage to recognise the truth of his own experience and apply that knowledge to better the lives of others. The “spurious” decision taken to close this facility is precisely the reason why many church establishment’s have largely become an irrelevance and a sickening example of hypocrisy to much of modern Britain, if a church is no longer to be a welcoming haven for the dispossessed and those seeking compassion and guidance then what is the point of it’s existence ? “throw open your arm’s and welcome all into the kingdom of god’s church” of course, provided that is, you first agree to conform to our specific and exacting guidelines of how to qualify as a cause that is worthy of our acceptance. Take heart Malcom, what you did has contributed to a change in attitude to a lot of marginalized people. Of course there are always those who lack the imagination and empathy to see that they themselves could be walking the same path but for some good luck and a good set of genes. 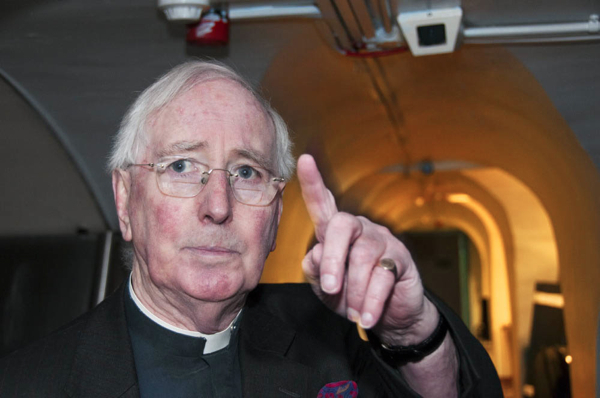 I hope the present vicar has the courage and” the big picture attitude” to open up again . The question wouldnt be asked however except that people like you did it first and showed that it worked. Shame on your successor !! Fascinating blog.-This is such a beautiful church. The compassionate work carried out here for people Living with HIV in the mid eighties, meant this was a very appropriate place for Mildmay to hold our 25th Anniversary Carol Service in December 2013. This is a really fascinating church- a great place to visit for a peaceful wander. Thanks for sharing this wonderful story. What a wonderful man…thank you so much for sharing this, Gentle Author. It has got my morning off to a thoughtful start. Excuse my bitter cynicism, but Malcolm Johnsons successors are the real christians, as would be seen by any student of history. Whereas Mr Johnson is “just” a generous and kind-hearted man, doing his best for those in trouble. I’m a proud Aldgate girl, born and raised. I was a pupil at Sir John Cass from 1979-1986 and St Botolph’s was ‘our’ church. Reverend Johnson was the person that I was raised with as our rector and I can not express how, nearly 30 years on, myself and all my family think of him with great affection. He really did have time for everyone. A good soul if ever there was. Now, when I look back, I feel blessed to have grown up around these wonderful, good-spirited and compassionate people like Reverend Johnson. Although, I live many miles away from Aldgate now, my Family Home is still there and I go back often. Whenever I walk through my Aldgate streets past St Botolph’s, I spare a thought for Reverend Johnson and wish him well. Thank you for posting this and allowing me to see that, other than the hair turning white, he is still the same old diamond geezer that he always was. The theologian Ken Leech took me to meet Malcolm Johnson in Tredegar Square back in the early 1990s when Malcolm was Master of the Royal Foundation of St Katharine in Shadwell. 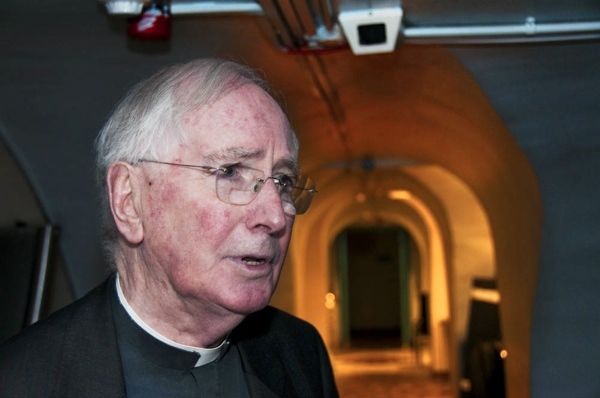 I was there to talk to him about his predecessor in that role Fr John Groser. As a girl of working class Irish Catholic stock I found these (to me) very posh but socially concerned Anglicans quite intimidating. But Malcolm was funny and charming and just really nice to me. I guess there was no space to mention Malcolm’s role as an author. I have a copy of his ‘Outside The Gate’ about St Botolphs but I see from amazon that last year he brought out an autobiography ‘Diary of A Gay Priest’. Will add to my wish list. All GOOD things must come to an end — unfortunately it’s true! I used to volunteer in the crypt in the 1980s and got involved in the church when Malcolm was rector and Nerissa was the curate and one thing and another I am now a vicar in Hackney. Malcolm is a great role model – gentle, determined, funny. Lovely to see him today in Spitalfields Life. more shocking than closing it is claiming it was bankrupt. where i come from that’s called a cover up. I believe you have to accept people as they are too. Enough said, because I cannot add to the what others have said so well, before me. Paul-o, in a previous Botolph’s post, said he wished there had been a photo of the Rev. Johnson… trust our Gentle Author to follow this through! On reading this quite lovely – and sad – text, it is obviously my loss that I never encountered Malcolm Johnson, but I did know and respect his equally-committed colleague Capt. Terry Drummond during my occasional visits to the crypt (primarily to see the men who slept at Providence Row). Adding my thanks here, to all concerned. 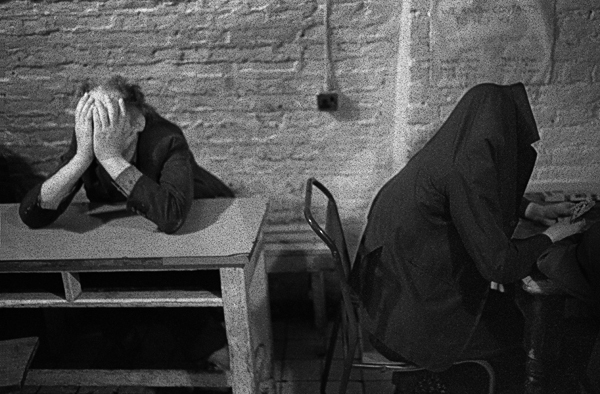 I worked at the homeless project in the early and mid nineties. Malcolm was a great man who along with other church staff, the crypt staff and all the wonderful volunteers provided a much needed and much used facility. Sadly many of these people have now passed away. I would like to mention one person and that is the late Mary Everingham who to those who knew her was not only the verger and volunteer but a wonderful friend to those who were lucky to have known her. I knew Malcolm in the 80s in another of his roles as Guild Vicar of St Ethelburga’s. He had a daunting workload. As well as two churches to look after he was Area Dean and was asked by Graham Leonard to setve a further term. This indicates that he was well respected by his Bishop. He topped the poll of clergy candidates in the General Synod election. He was therefore obviously respected and trusted by his fellow clergy. He also served as Lord Mayor’s Chaplain – obviously held in high esteem by the Lord Mayor. Yet I suspect the comments posted on this website by a former parishoner and a former user of the shelter would mean more to him. He has had a remarkable ministry. I came across this article because I had a few days free over Christmas and wanted to come back and help the homeless at a place where I was a volunteer in the mid-80′s. I am so sad to learn that the crypt centre closed. I remember a church which was fully employed in the service of God. 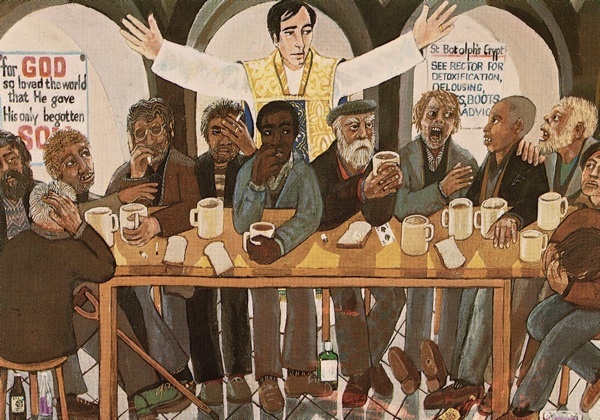 There was the Gay Christian Movement based in the tower, the homeless were looked after in the basement and the main church was active all the week round. This included a series of lunchtime talks by high profile speakers who were all in the public eye at the time, like Sir Keith Joseph. Malcolm is a remarkable man who achieved remarkable things in God’s service. A true Christian and an example to all.